Last Friday, I helped oversee a cafeteria waste audit at Bucknell. It was my last day at the school and it was a nice culmination to a week of food waste awareness. It felt like a final exam–to gauge the impact of the week’s conversations, the posters in the cafeteria and a previous waste weigh. October waste audit: 1.5 ounce/student. April waste audit: 1 ounce/student. By my math, that’s a 33 percent reduction! Bravo, Bucknell! Not to mention, that’s a low amount of waste per person per meal. Especially in an “all-you-can-eat” setting. Granted, this was during lunch, as both waste weighs were held from 11:30 a.m.-1:30 p.m. on Friday. Granted, the poundage would most likely be higher during dinner. But still, the improvement was the most encouraging and important aspect. Friday’s waste weigh was a combined effort of several dedicated student volunteers, interested faculty members and Parkhurst Dining staff. 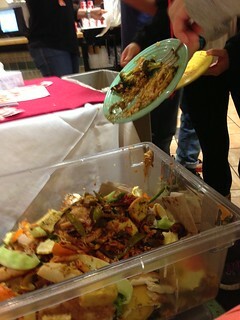 My thanks to all involved, including the students for scraping their plate waste into the bin. One guy (an international student, for what it’s worth) saying repeatedly that we should do this more often. Another guy really not wanting to scrape his plate into the bin, saying a few times: “This is nasty!” Yep, and that’s part of the awareness raising. Worst example of waste: A grapefruit peeled a tiny bit, but not eaten at all (see pic). Silliest waste: 3 packets of individually wrapped crackers that had to be throw away because a student took them on their plate. Sometimes health code rules are just silly. 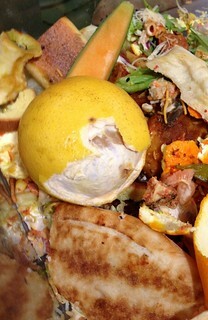 This entry was posted in College, General, Personal, Worth a Thousand Words and tagged Bucknell, college, food waste, Jonathan Bloom, Parkhurst, university, waste audit, waste weigh, Wasted Food. Bookmark the permalink. Both comments and trackbacks are currently closed.